... on something new two. Yesterday I listed these leaves. 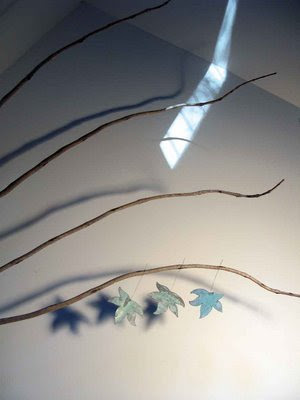 I photographed them late in the afternoon and my hanging branch thing just looked so lovely in the afternoon light, and there was this little block of sunlight making its way up the wall as the sun went down. These leaves are something new for me - I was inspired by a deciduous tree outside my house which only loses all of its leaves when it's been a very cold year - right now it's bare, and I'm wearing four layers inside! ... on my middle finger. I made a couple of Beasties today. The smaller circle above is from when I was getting a bit confident with the vice and, undoing it, pinched my finger between the two undoing thingos. 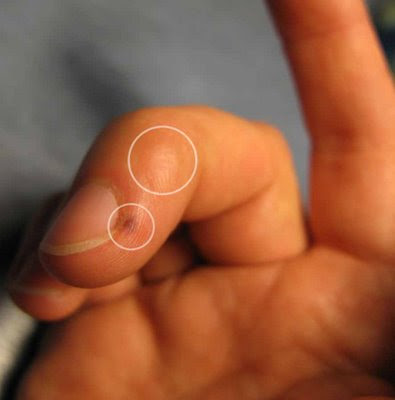 The larger circle is where my big callous is from using my scalpel to carve letters. My scalpel is NOT ergonomically designed, apparently.